Hey there, friends! 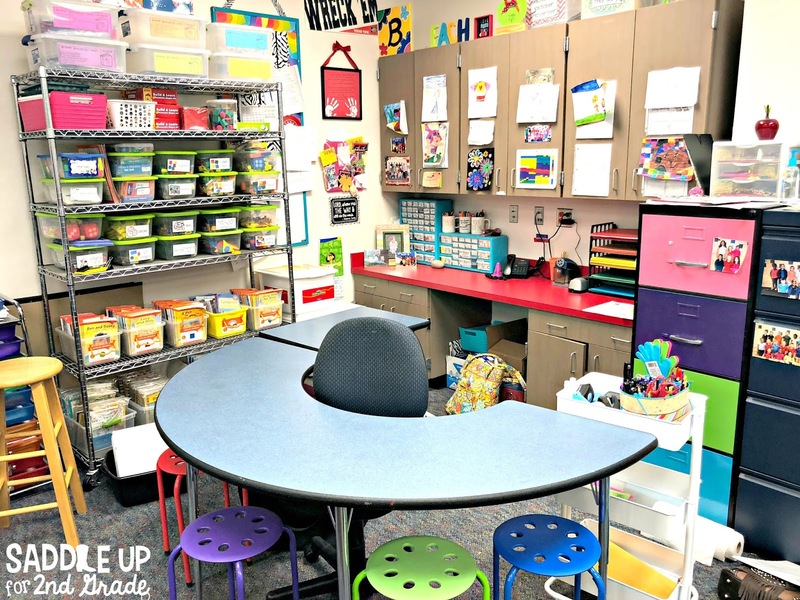 I often get asked what the inside of my classroom looks like or how I set up specific areas. 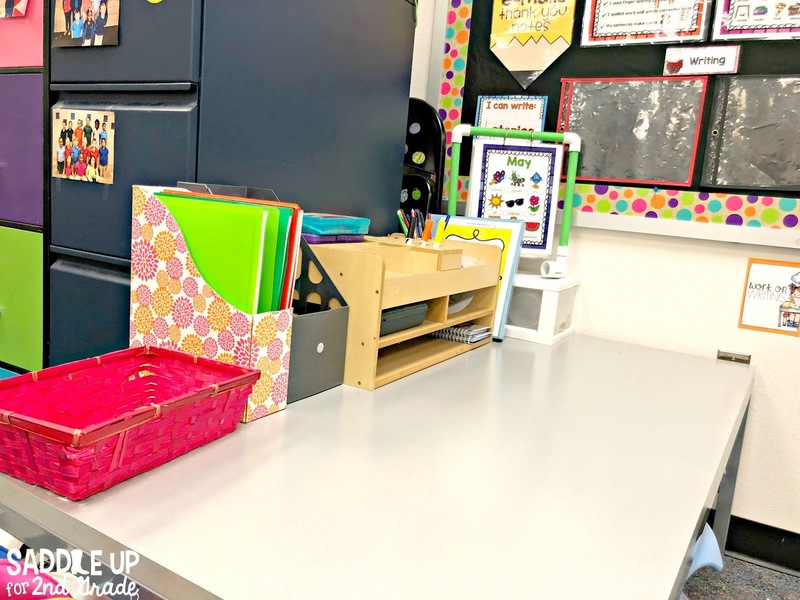 Today I’m going to give you a tour of my classroom but this wont’ be your traditional back to school post where everything is neat and tidy. Most of these photos were taken randomly throughout the school year or at the end of the year last year. I’ll be the first to admit that I’m a type B teacher. 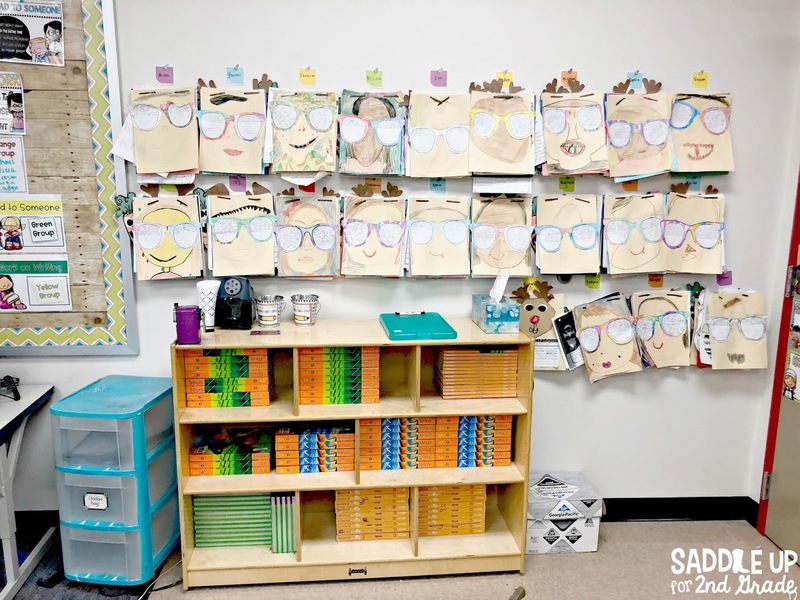 I’m not good at organization and most of the time my classroom is a hot mess. I don’t have a photo of every single angle of my classroom but I can give you a general idea of what my home away from home looks like. Let’s enter room 205 shall we! This is what my classroom looks like when you enter. 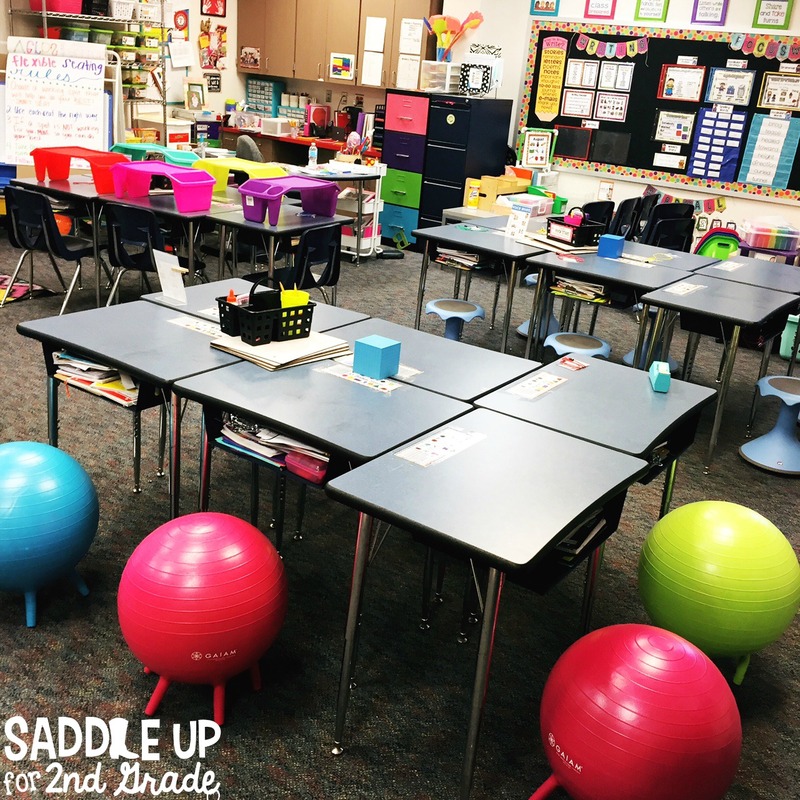 I have a flexible seating classroom but had to leave my desks in my room. Eventually, the first two groups of tables (where you see the lapdesks) were lowered all the way to the ground). 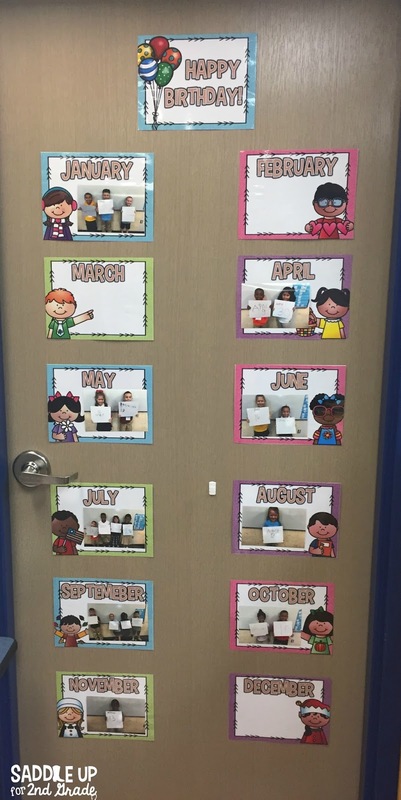 When you enter my classroom, just behind my door is my student display area. 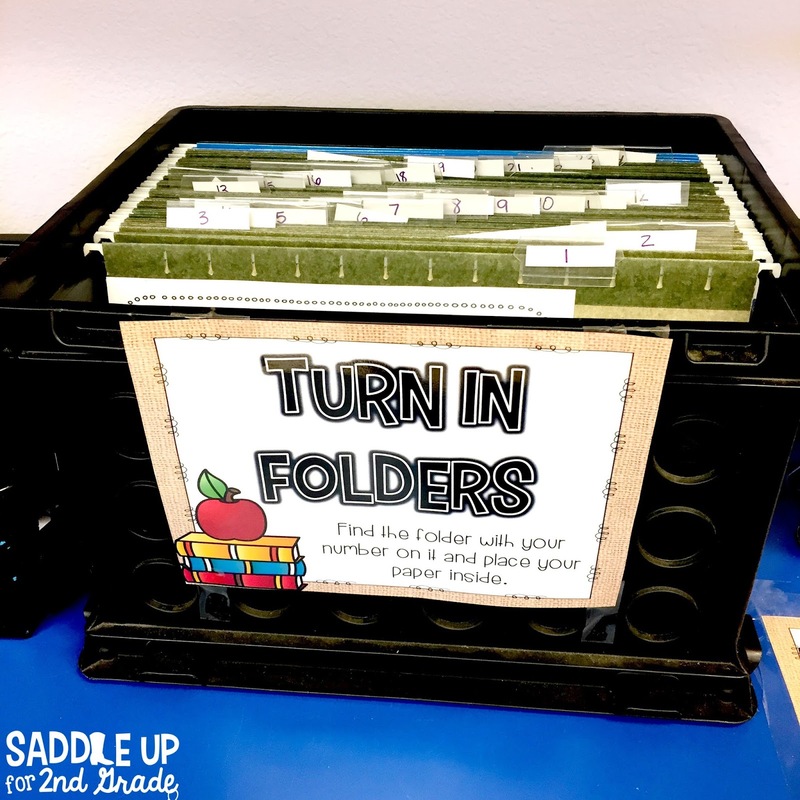 I use these two fastener folders from Amazon to display student work. 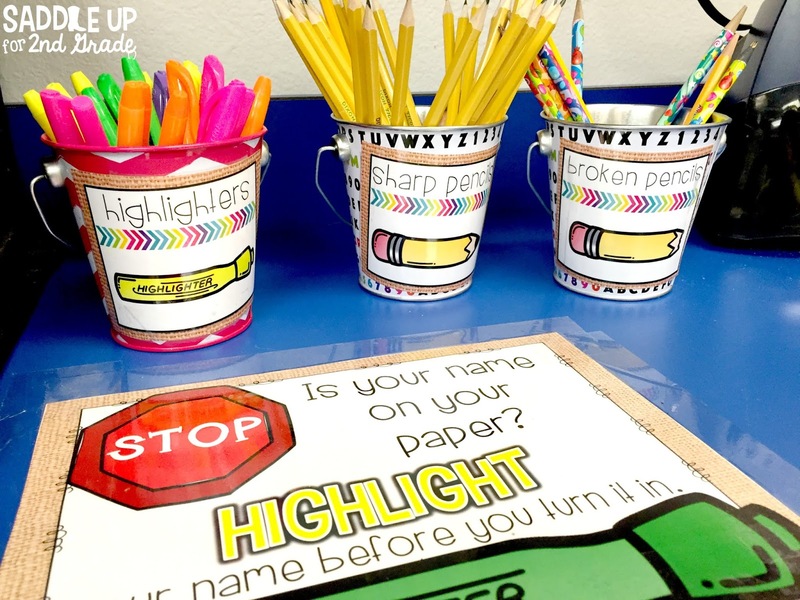 All year long we add student writing, crafts, or any other work I feel like would make a good addition to our scrapbooks. At the end of the year, I simply take the folders down off the wall and add a cute cover to give to students as end of the year gifts. I love to see how much they’ve grown and this is the perfect way to do it. On the back of my door you see my student birthday display. 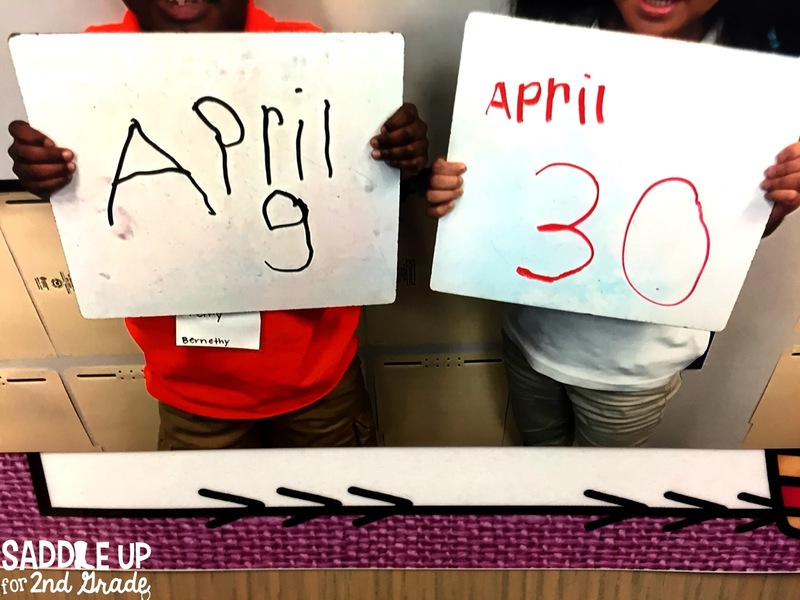 At the beginning of the year, I have my kiddos write their birthday on a whiteboard. Then, they hold them up and I take their picture by each month and place them on the these monthly posters. 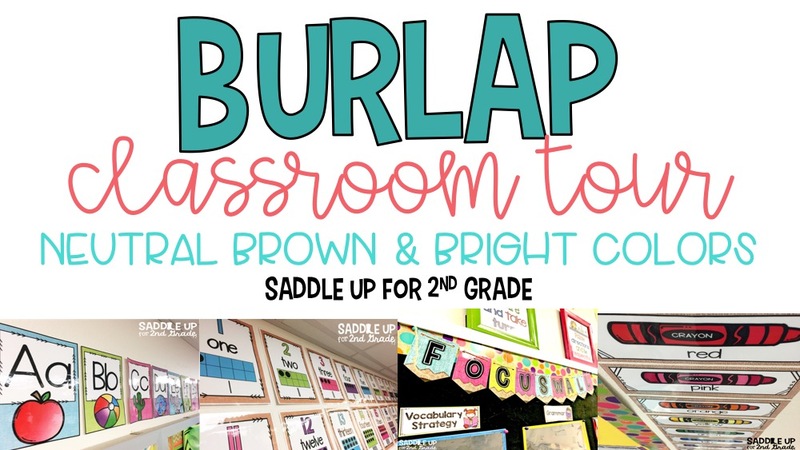 You can grab these burlap themed posters in my TPT store. 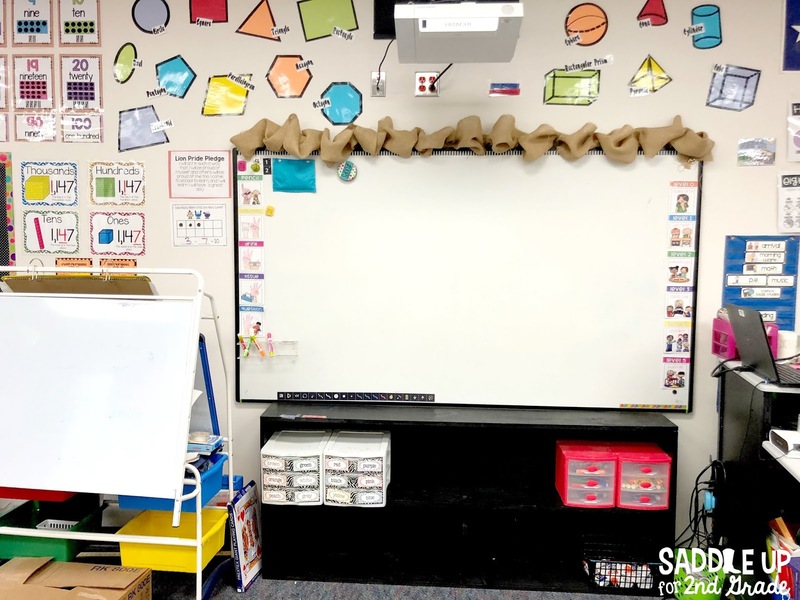 To the left of my student work display I have a large whiteboard with two bulletin boards at each end. The first smaller board holds my Daily Five posters and rotation chart. Each of my Daily 5 groups is named a color. I used velcro dots on the back of the tags and the color cards are just moved through each rotation. This large white board doesn’t get used much. 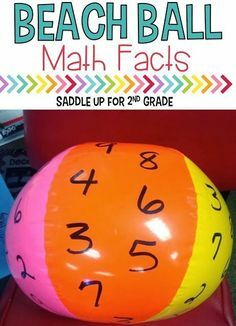 I’ll hang anchor charts on it or large pocket charts when needed. The turquoise pocket chart with numbers you see below the board holds our headphones. You can read all about this in this blog post. 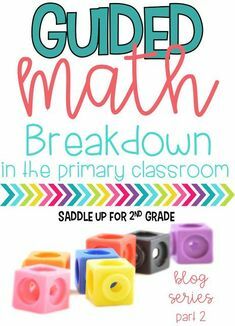 Click here for turquoise pocket chart with numbers. Above my white board you’ll see a classroom quote along with my alphabet line. I wanted my students to always know that no matter if we had a good or bad day, they are always loved. To make these letters I just enlarged some of my favorite fonts and printed them onto colored paper. My alphabet line has a bright burlap theme. These come in half sheet sizes and two to a page. You can get them here. They are also available in a traditional brown burlap too. On the other side of my whiteboard you’ll find my math station area. You can read a detailed explanation about my set up in this blog post. 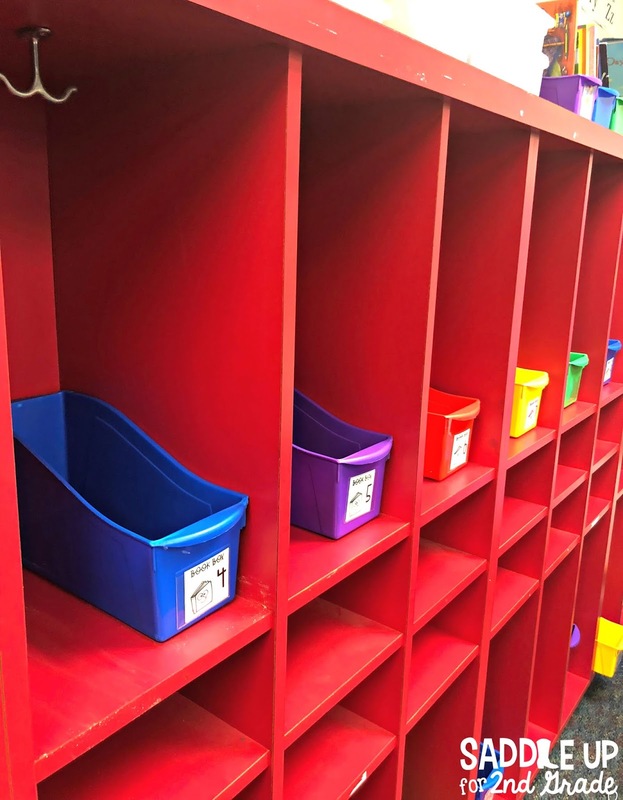 The colored cart holds all of my math stations I have made by standard. All of the baskets and containers you see here were purchased at my local dollar store. 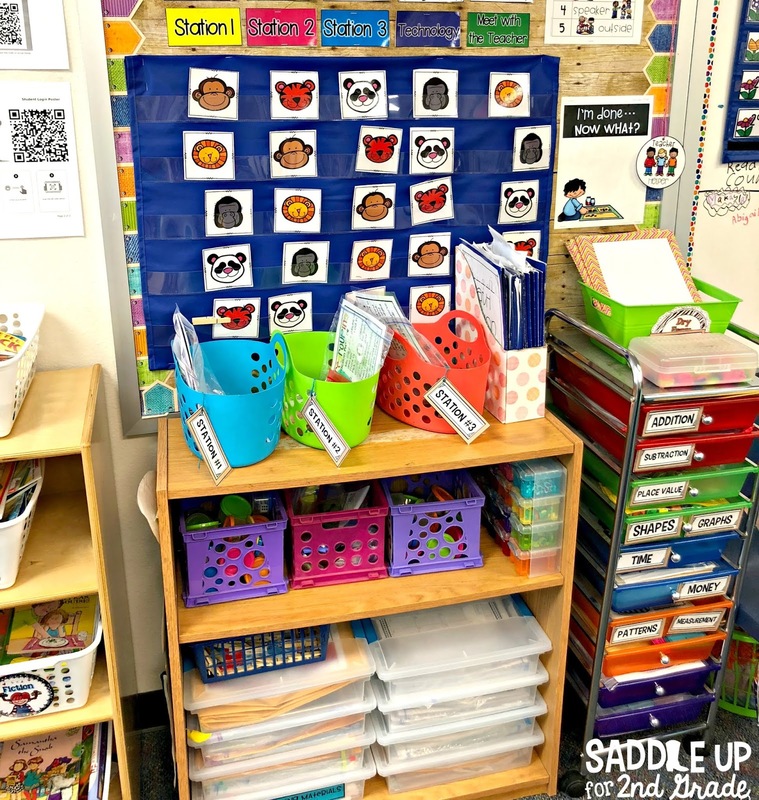 The baskets on the top hold our weekly math stations. The purple and pink baskets hold commonly used supplies such as dice, spinners, and dry erase markers/erasers. The Sterilite containers at the bottom of the small shelf hold all of my monthly math stations. I really should probably label those…. Just on the other side of our math station set up is my library corner. 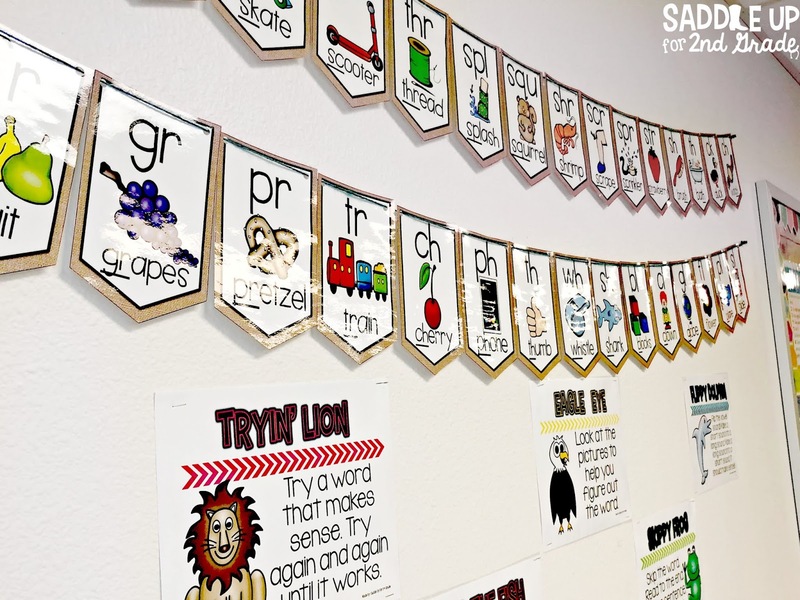 Above my library you’ll find these burlap phonics posters (these are also available in chevron and polka dot) and reading strategies posters (free!!). The white baskets were purchased from Dollar Tree. I’ve used these baskets for four years and only had a few break. If one does, I’ll just go replace it since they are very inexpensive. You can get them here. I use the black shelf to display seasonal or topical books. The turquoise basket on the floor holds all of our book buddies. 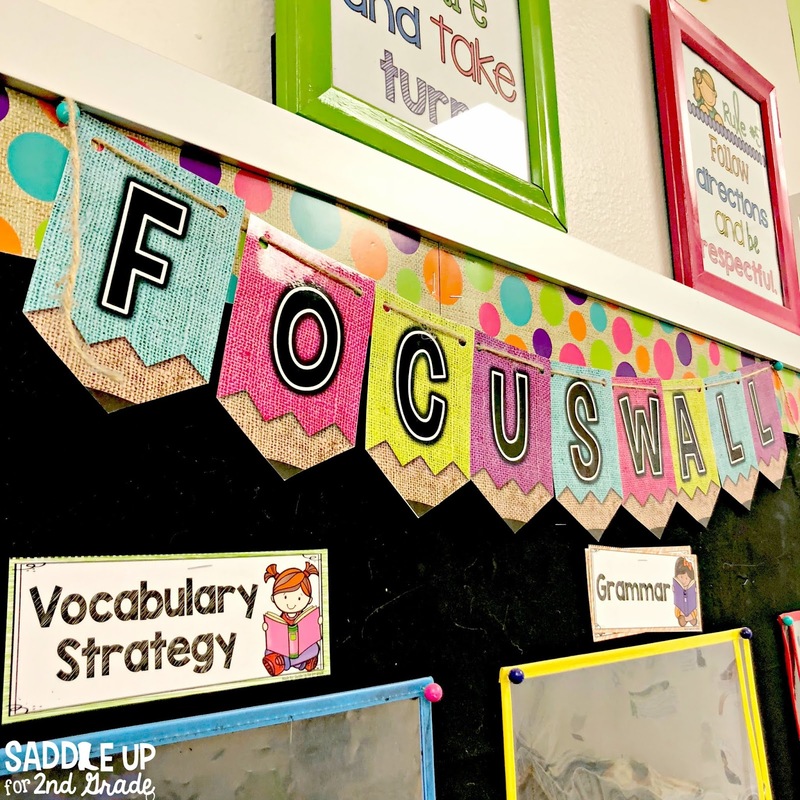 The back wall of my classroom holds my focus wall, writing center, and VIP table. 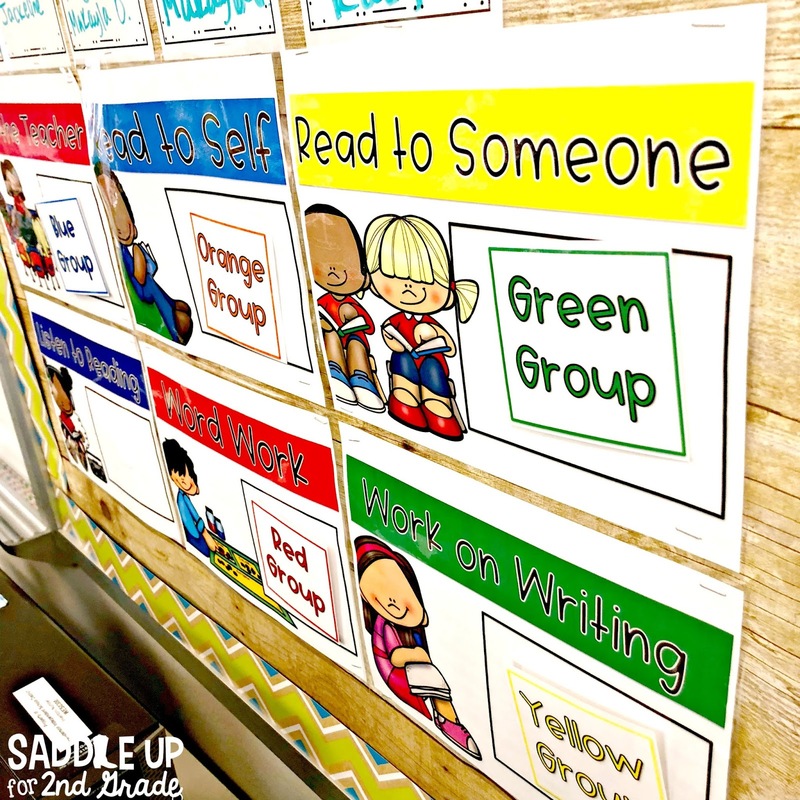 Above you’ll find my classroom rules posters (free). I bought the 8×10 frames from Hobby Lobby years ago. 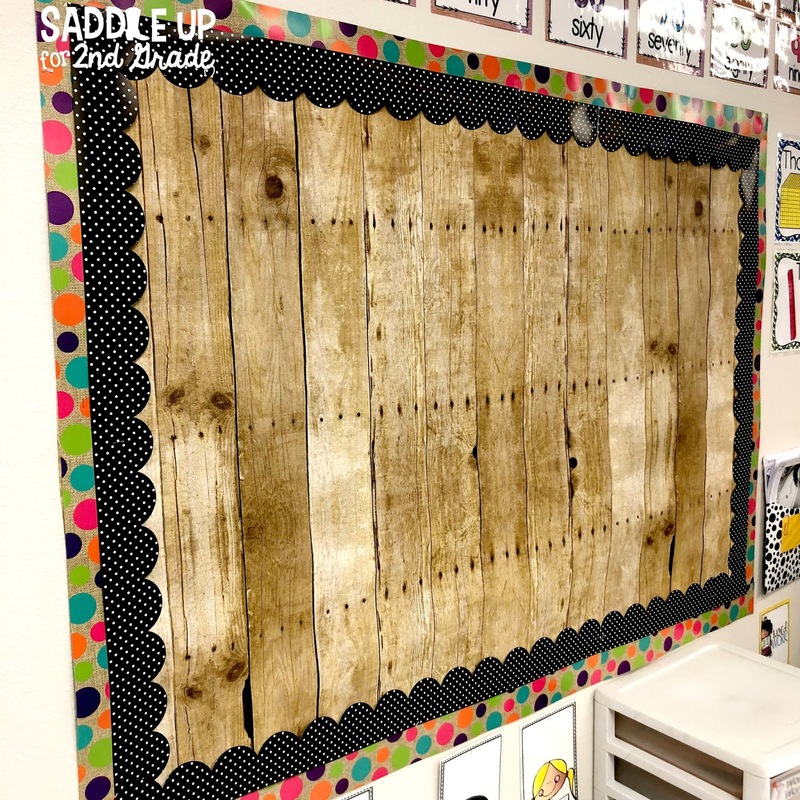 All of the headers on this board were made with these editable burlap pencil banners. 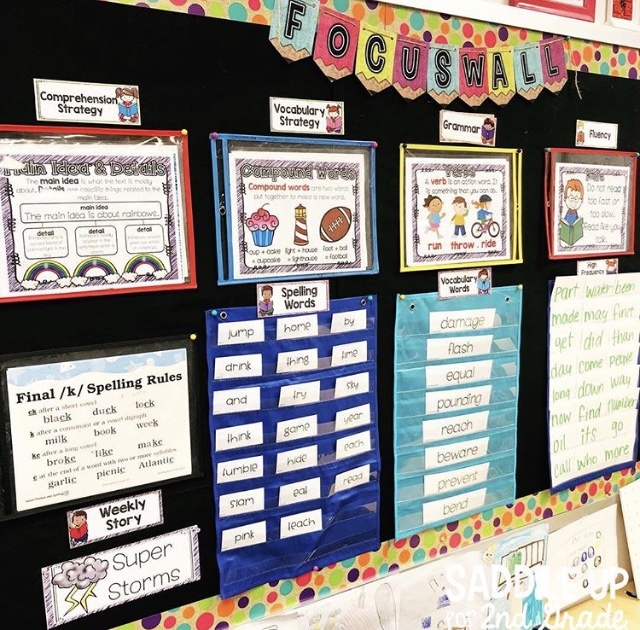 My focus wall is one of the most utilized areas in my classroom. 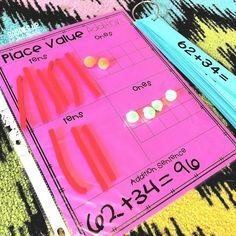 I use these plastic sleeves to store anchor charts. The mini pocket charts hold all different word lists for the week. You can get the focus wall headers (free) by clicking here. My writing center holds all of the materials students needs to write independently. The folders you see are their writing portfolios. The cube holds our monthly writing task cards, fun writing tools (crayons, markers, stamps, etc..), and paper. Across from my writing center I have a similar tablet that is my VIP area. I have table caddies is special supplies. If I see a student demonstrating outstanding behavior or manners I’ll allow them to sit at the VIP table for the day. Posters can be found here. 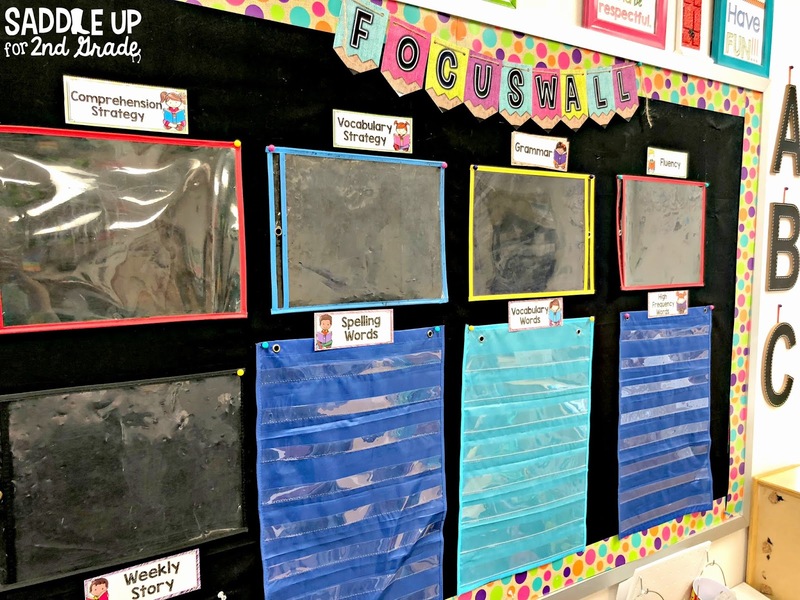 Below my focus wall is where I have my interactive word wall. I love this for so many reasons. First, it takes up so little space. 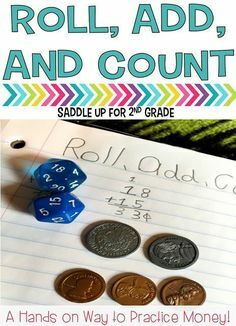 Second, kids can add words to it all year long. Third, they can access these word rings anytime they are writing. I teach my students at the beginning of the year to how to use it and take care of it. They are responsible for it all year long. You can get it here. Up next is my teacher area. I must confess…I took this photo during my last week of school and this was the cleanest it had been all year. The stools around my teacher table came from Amazon. You can get them here. These are so durable. The seats are made of heavy duty plastic. I also have some similar from the dollar store and they have not held up like these have. 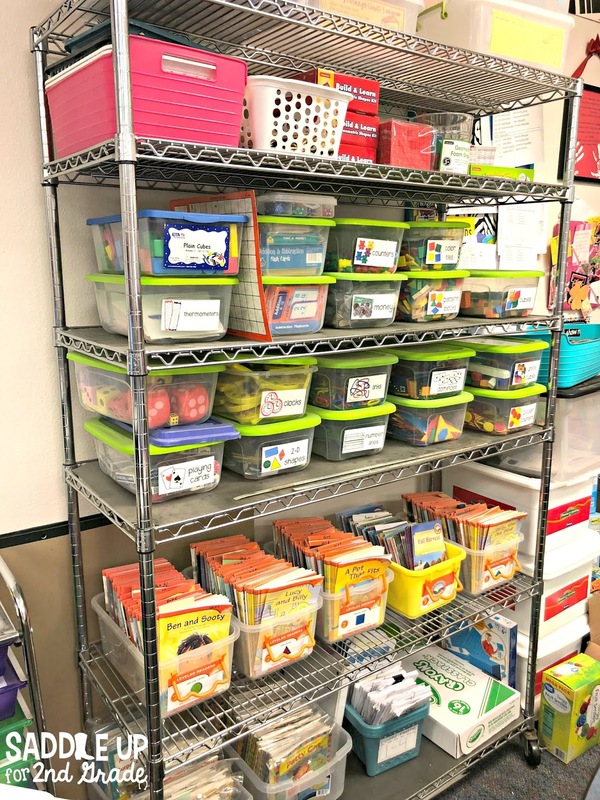 In my teacher area I have this large cart that I use to hold all of my math manipulatives and guided reading materials. Moving on the front of my classroom. On the front of my whiteboard you’ll see nonverbal hand signal posters and voice level charts. Both of these can be found here. My husband build me the shelf underneath my board. 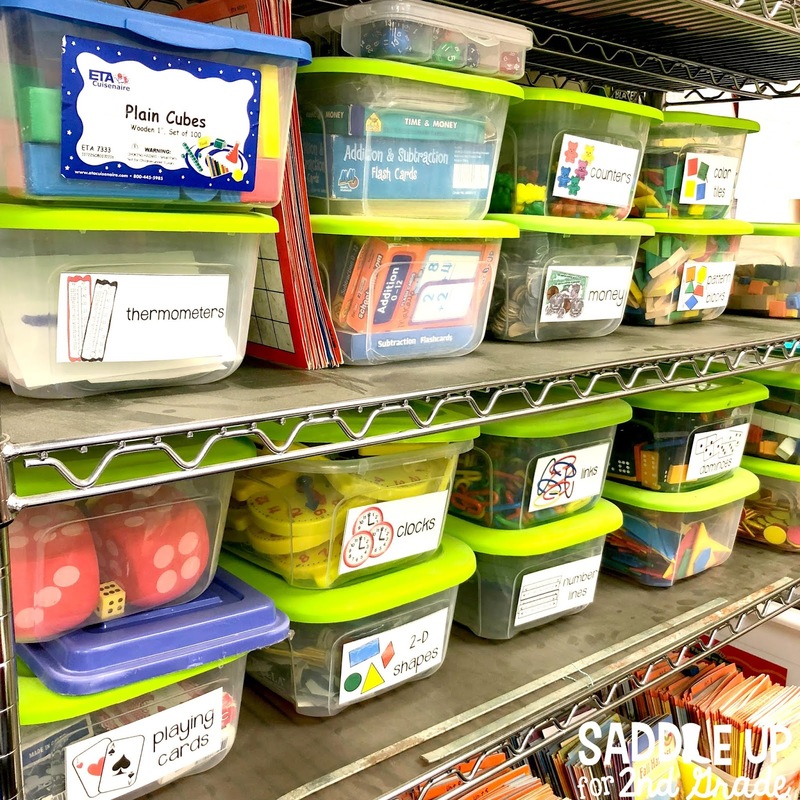 All of our shared classroom supplies are stored there in baskets. Yes, I know there aren’t any baskets in the photo. Whoops! 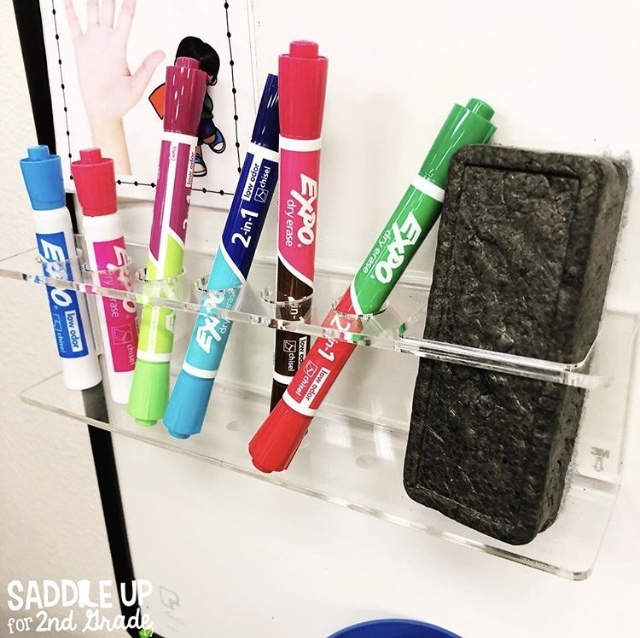 I got this acrylic dry erase marker holder from Amazon. I mounted it to my board using command strips. 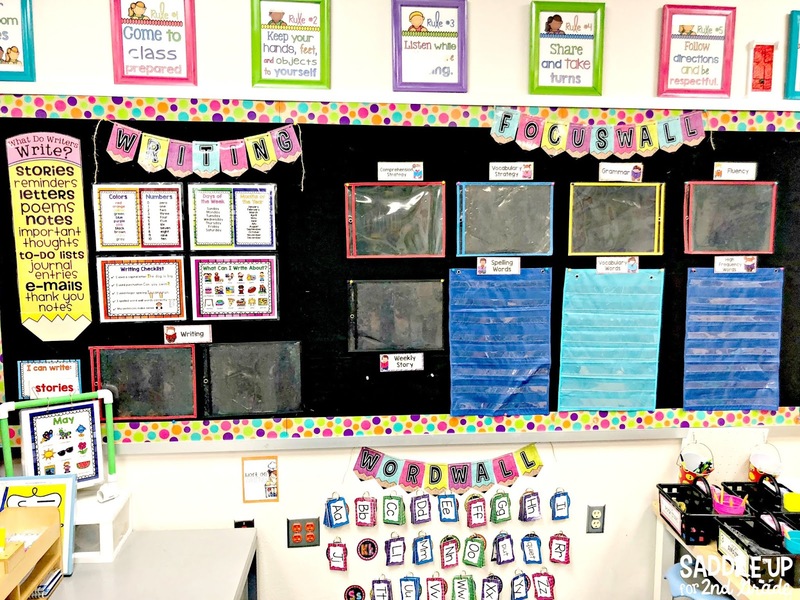 This mock bulletin board displays large anchor charts as they are created throughout the year. I got the wood paper from Amazon. The borders are from Creative Teaching Press. Above my word work center are my burlap number posters. Down the side I have burlap color posters. 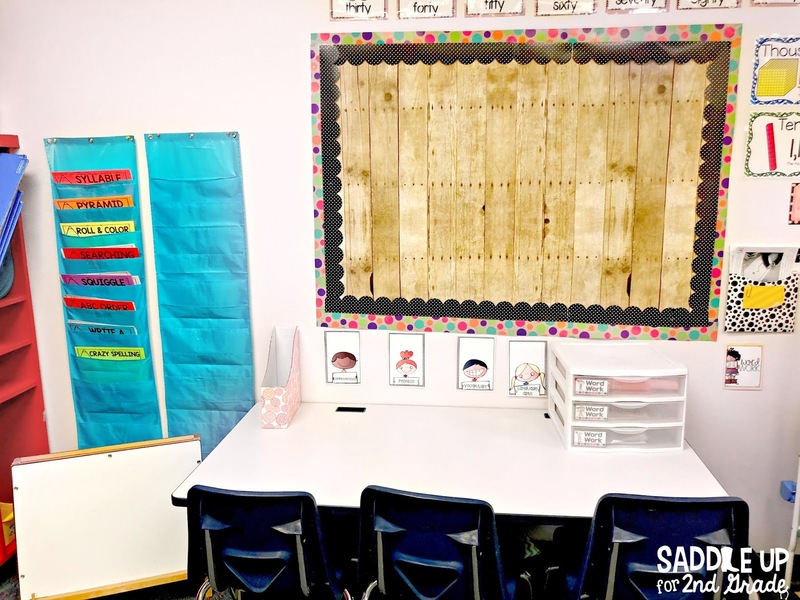 Previously when I taught first grade that area where I mentioned I hung anchor charts was replaced with my burlap calendar board. This was changed when I moved back to second but wanted to show you what it looked like then. As we near the end of our classroom tour you’ll find a wall of cubbies. The book boxes were purchased as a class set from Overstock.com last year. This is also where their backpacks are kept. And now we are back to my front door. I have a small set of shelves and cabinets where my turn in trays are kept. I use a crate with hanging file folders for a turn in box. Each child has a folder with their number on it and when turning in work they place the paper inside their folder. This helps with knowing who has missing work. I hope you enjoyed the tour of my little home away from home. I’ve linked some of the items I’ve featured in this post below. 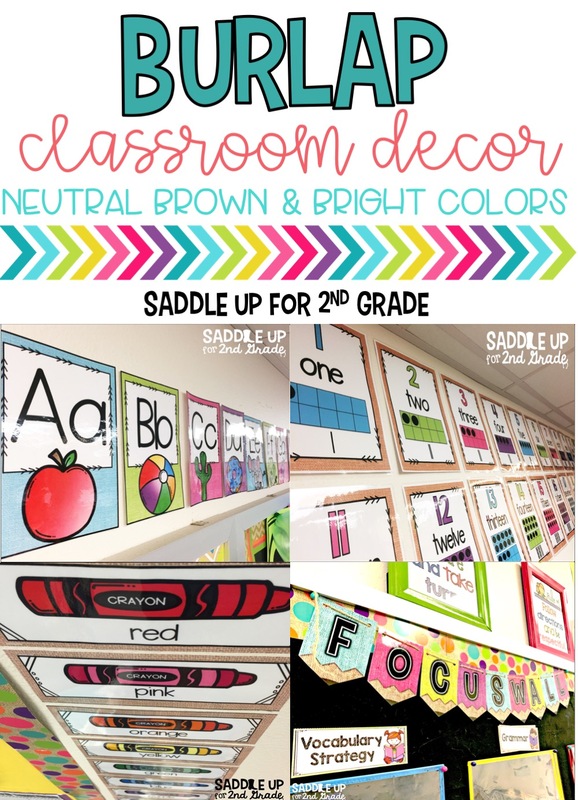 All burlap classroom decor can be found here . 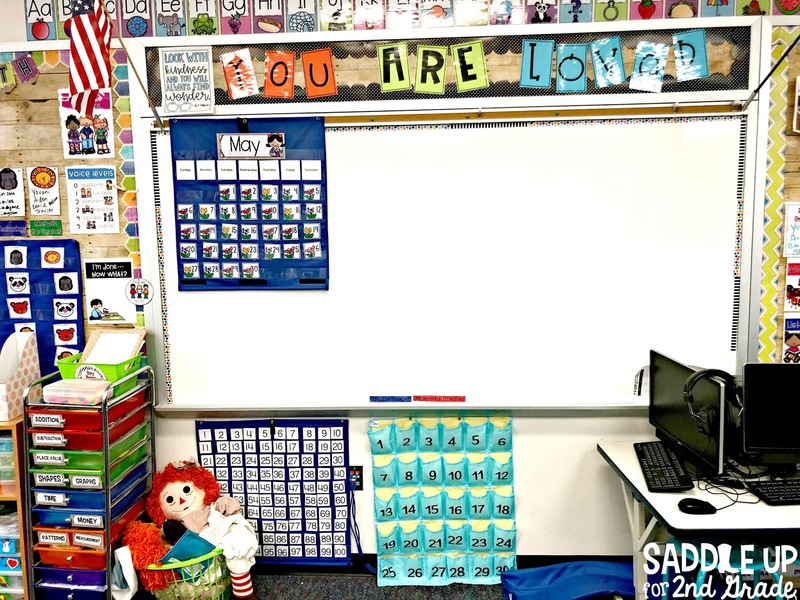 The borders used on my bulletin boards were purchased from Mardel. They can be found here, and here. 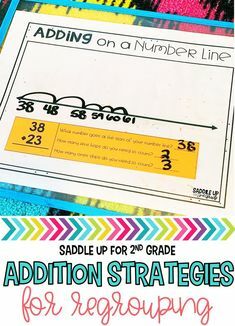 Want to receive exclusive updates and freebies from Saddle Up for 2nd Grade? Sign up for my weekly newsletter below!